AIST provides a wide range of quality resources that make the exchange of technical knowledge and information possible among steel industry professionals. These resources not only help broaden your industry knowledge, but provide a view into significance of the steel industry. Additionally, AIST offers an interactive version of the Steel Manufacturing Process (known as the AIST Steel Wheel), Steel Glossary, an Online Buyer's Guide, formerly known as SteelLinks.com, educational videos, including winning entries to the AIST Real Steel Video Challenge, and industry statistics. The Story of Steel section includes “Steel and You: The Life of Steel,” among other resources, to provide a view into significance of the steel industry. 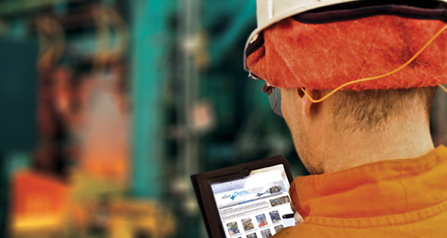 Broaden your industry knowledge with AIST’s resources. 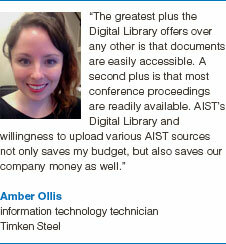 The AIST Digital Library is an online resource for the steel industry featuring over 10,000 full-text documents for academia, metallurgical, engineering, operating and maintenance personnel in the iron and steel industry.